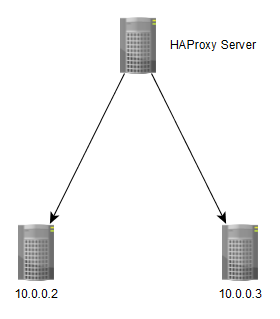 Apache’s HAProxy is a proxy software but it can also load balance between servers. The significance of version 1.5 is it’s ability to handle SSL connections where as before you needed to off load the connection to a different server such as nginx or Apache. Unfortunately the the latest Long Term Release (LTS) of Ubuntu came out 4-5 months before 1.5 made it to stable release. This means 1.5 was not include in the official repositories. Fortunately Vincent Bernat has created and maintained Personal Package Archives (PPA) so that it can be installed using apt-get. frontend – Handles incoming connections e.g from users going to the website. backend – Servers which process the requests and where necessary generates a response. HAProxy allows rules to be configured to match on incoming requests and direct the request to the relevant backend. It’s not a 1:1 relationship so multiple frontends can be redirected to the same backend. For now we will just make a load balanced configuration which means you’ll need 2 or more servers. Any names used in configuration from frontend to cookies can be changed to any name as long as they are one word and it’s best not to use too many special characters. frontend – configuration for handling incoming requests. backend – servers where requests are forwarded to process the requests. Defines the section for a front end. The second word after frontend is the name of the frontend. The interface and port the frontend will accept and handle incoming requests. The * means any interface and :80 is the port. Forward extended header information to the backend. Forward the source IP to the backend. This tells the front end what backend to forward the request to. wordpress-http is the name of the backend. This backend will only be used if the request was trying to access the domain name dannytsang.co.uk. Multiple lines can be used to define different pattern matching and pass the request to different backends. Passes the request to wordpress-http if no matches were found. Declare a cookie for cookie based sticky session. The cookie name is called WP_ID and it will be inserted into the client’s session. Create a server as part of the backend group named wpssl1 and it’s IP address and port (10.0.0.2:443). The server will use a cookie based sticky session. The cookie to check if the client has already had any dealings with HAProxy before is called wp1. It will also perform periodic checks on this server to make sure it’s up. As above but the difference is this one is an SSL connection (ssl) and also the backend will have it’s own SSL which it should not check it’s validity e.g for self signed certificates (verify none). On my “journey” to attempt to get high availability, I have found the prefix for a cookie session didn’t work for TT RSS, a self hosted RSS aggregator. It would constantly reload the whole page when it made a call to backend.php. The prefix means it will use an existing cookie and attach session data. I may have been configuring it incorrectly so it may not have detected an existing cookie to use. The above example sets up a Layer 4 load balancing strategy which is one of the basic methods of load balancing. The advantage is higher availability but complications can arise if the backend response are not synchronized and managing sessions (both beyond the scope of this article). I.T software professional always studying and applying the knowledge gained and one way of doing this is to blog. Danny also has participates in a part time project called Energy@Home [http://code.google.com/p/energyathome/] for monitoring energy usage on a premise. Dedicated to I.T since studying pure Information Technology since the age of 16, Danny Tsang working in the field that he has aimed for since leaving school. View all posts by Danny →	This entry was posted in Networking and tagged cookie, HAProxy, proxy, ssl, Ubuntu. Bookmark the permalink.